AuSable, a Town in Clinton County, derives its name from the AuSable River, which means “of the sand”. 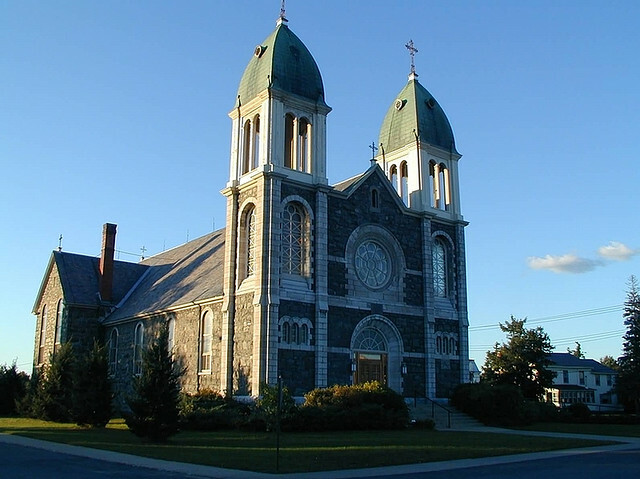 The Town is in the southeast corner of the County, south of Plattsburgh. The Town has a total area of 43.9 square miles with 39.1 square miles of land and 4.8 square miles of water. The Town borders Lake Champlain to the east and Essex County to the south. 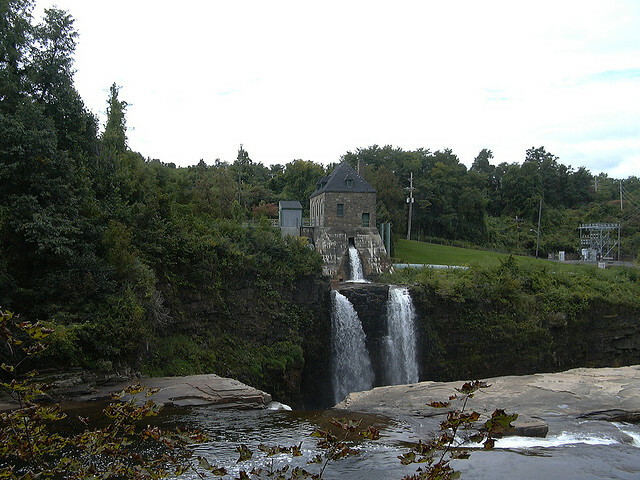 AuSable Chasm, a popular tourist location on the AuSable River, is nearby. Interstate 87, the Adirondack Northway, is an important north-south highway that passes through AuSable. US Route 9 runs closer to Lake Champlain than the Northway. US Route 9N runs east-west along the south Town line, joining US9 in Keeseville. New York State Route 22 is a north-south highway mostly lying west of the Northway. 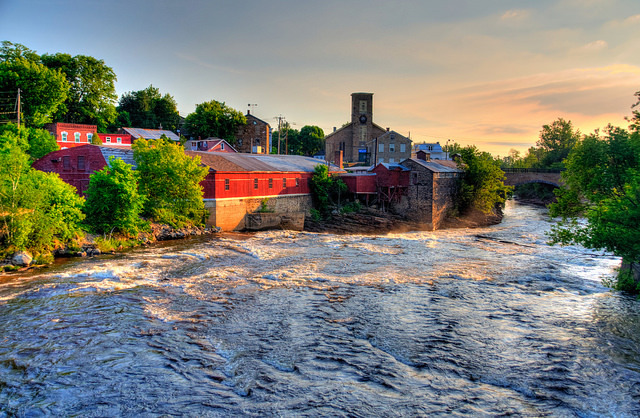 The hamlet of Keeseville was originally called "Anderson Falls", but the name was changed circa 1812 to "Keeseville", after a local manufacturer and businessman. The early hamlet was an industrial area devoted, in part, to lumber, iron processing and milling. The north half of the hamlet is within the town of AuSable in Clinton County, while the southern half is in the town of Chesterfield in Essex County. Keeseville is the birthplace of Civil War photographer William Henry Jackson, born April 4, 1843. Jackson achieved national and international fame as a frontier photographer and as an accomplished American painter. He was an explorer and photographer with various geologic surveys of the time. His photographs of the American frontier are famous; the glass negatives of which are housed in museums around the United States. Jackson joined the U.S. Army in 1862 and was present at the Battle of Gettysburg. Architect Isaac G. Perry also lived in Keeseville. In December of 2014, The Village of Keeseville dissolved it’s corporation and divided into the Town of AuSable and the Neighboring Town of Chesterfield. 12,000 years ago, tribes of hunter-gatherer natives fished and hunted along the shores of Lake Champlain and the two AuSable Rivers we know today. Over the millennia the native peoples developed small agricultural communities. When Samuel de Champlain and his men paddled down the great lake from Quebec in 1609 the area was magnificent. Fish and game, black flies and mosquitoes were plentiful. For many years, claim to this land was contested between the Mohawk members of the Iroquois Confederacy and the Algonquians. On his exploration trip, Champlain encountered and fought with the Iroquois who then became fierce enemies of the French invaders. The Iroquois eventually allied with the English and the area surrounding Lake Champlain became a bloody battleground in the French and Indian War. In the Treaty of Paris of 1763, the French surrendered their North American possessions to the British. And, the Iroquois claims to the land between the St. Lawrence River and Lake Champlain were finally recognized. England’s King George granted land in northern New York to men who had served in his army. One of these was William Gilliland who in 1765 explored the AuSable River from its mouth to AuSable Chasm. Two years later he surveyed what are now the Towns of Chesterfield and AuSable. Gilliland became the first permanent white settler on the western shore of the lake. The Champlain Valley erupted in war again; this time between England and its colonies. The Revolutionary War disrupted all early attempts at settlement including those of Gilliland. In fact, 6 the English General Burgoyne in 1777 swept through the area with almost 7,400 men and 1,500 horses and destroyed all evidence of the mostly deserted Gilliland settlements. With the end of the war in 1783, the Iroquois claims to the land were unprotected and the government of New York State paid them $1600 for all rights and title to any land they had claimed within the state’s boundaries. Few natives remained in the area; the last being seen near what is now Keeseville in 1810. Archaeological evidence of the native population has been found on Hallock Hill, along the lake near AuSable Chasm, and north of Harkness. To recruit defenders for the North Country, the state offered land holdings in its Military Tract legislation of 1786. Ironically, after the land was surveyed and divided into lots, no part of it was ever patented to military claimants. It was this large, state-organized tract that paved the way for permanent white settlement in the Adirondack-Lake Champlain region. Land office commissioners sold mostly small patents to private individuals. Beginning in 1787, Quaker farmers established a permanent settlement at Union, which is on the present boundary of the Towns of AuSable and Peru. These early efforts to farm took advantage of the level, arable land located in the north of the Town of AuSable and in southern Peru. 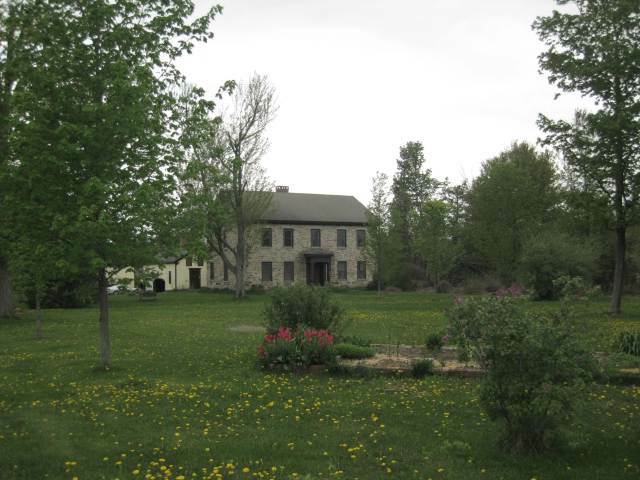 They gradually expanded their fields to Hallock Hill and Harkness where they grew wheat, corn, and potatoes to live on, but later branched out to a lumber and potash trade in Plattsburgh and southern Quebec to supplement their income. The Union Village built the first schoolhouse as well as stores, blacksmith shop, taverns, and a religious meetinghouse in the area. The 1790 Platt Rogers Road went from Willsboro to Keeseville to the top of Hallock Hill and on to Plattsburgh. It was the area’s first road. But progress was slow. The harsh climate, rugged terrain, thin and stony soils made agriculture difficult. What was under the soil would prove to be the impetus of the area’s growth: iron. Late 18th century settlement of the present Towns of Jay, AuSable, Black Brook and Chesterfield centered almost entirely on farming and small-scale mill operations. And yet, during the first half of the 19th century, in no other part of the Adirondack regions was the impact of the iron industry on settlement and demographic growth greater than in the AuSable Valley. It was during this time that the communities of Clintonville, AuSable Forks, Black Brook, Keeseville, AuSable and New Sweden were established, all driven by the discovery of some of the richest ore mines then known to exist in the country. Iron was actually discovered in the last years of the 18th century in the Town of Jay. Iron was found on Arnold Hill in 1806 and by 1810 mining began. One of the most significant of the mining operators was the Peru Iron Company, which created the mining and manufacturing village of Clintonville. Directly south of the Arnold Hill mine, two forges were built on the AuSable River at a place they eventually named New Sweden. The Peru Iron Company imported Swedish workers to mine the ore. So they changed the name from Finchville to New Sweden. By 1855, 150 people lived there, but the flood of 1857 destroyed the forges and most of the homes. The settlement never recovered. Clintonville played the dominant role of the iron industry in settlement and demographic growth between 1800 and 1845. Incorporated in 1825, Clintonville boasted an iron industrial complex that by 1845 produced over 1600 tons of iron and 1800 tons of nails annually. Over 2000 people lived in the village and surrounding area. 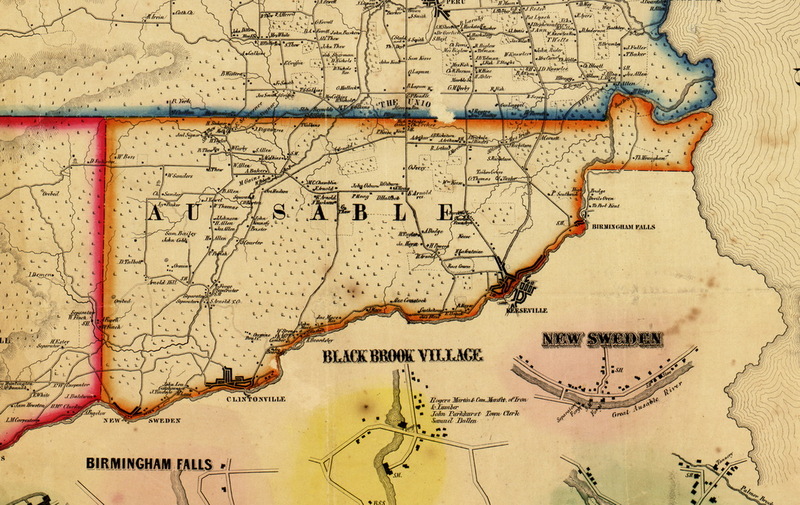 The Town of AuSable was formed in 1839. By this time, the iron-manufacturing boom was in full swing. Nestled within the town’s boundaries, the Village of Keeseville was benefitting from the general prosperity of the area. Those who farmed prospered from provisioning the families who supported the iron industry. Transportation facilities were developed to support the shipment of iron ore and goods to Lake Champlain and to the developing railroad heads. As people came to the area to work in the mines and villages grew, the need for education and religion led to the building of schools and churches. Originally populated by Quakers, the era of immigration to the United States from Europe led to population by Swedes, Irish, and French. Most of the French who came to the area were from Canada. It was this wave of industrial development in the first half of the 19th century that resulted in the most significant residential growth in the town’s history. However, by the 1870’s the area’s importance in iron production was slipping away to bigger mines in the western United States and to the growing railway system, which could service them. The decline of the iron industry in the AuSable Valley signaled the end of the area’s growth and development. It was to be replaced by some wood products industry and the increasing tourism industry. But much of what we see today in the various villages and hamlets was established by the time the iron industry of the AuSable Valley closed in 1893. 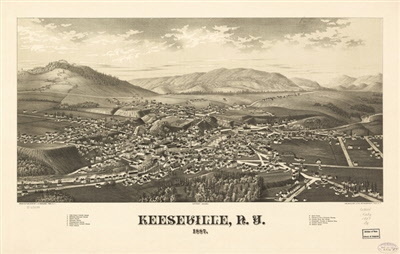 Although the mining industry disappeared, the Village of Keeseville was spared economic disintegration because it had a more diverse manufacturing base. Though the horseshoe-nail factories closed, the village remained an important transport, manufacturing (wood products, furniture, textiles) and service center. Those communities that had depended so heavily on the iron works, Clintonville for example, suffered rapid decline. What the railroad no longer exported from the Town and Village: iron manufactories, it now imported to the area: tourists. 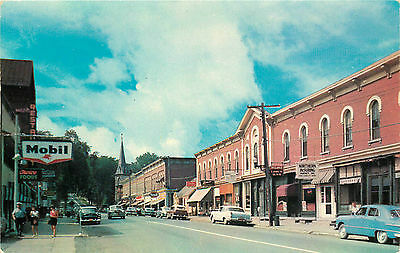 The Town and Village began to capitalize on what was to become a major industry for the area. This new industry would inspire a wave of residential development in previously uninhabited or sparsely inhabited sections of the area. There were really two waves. 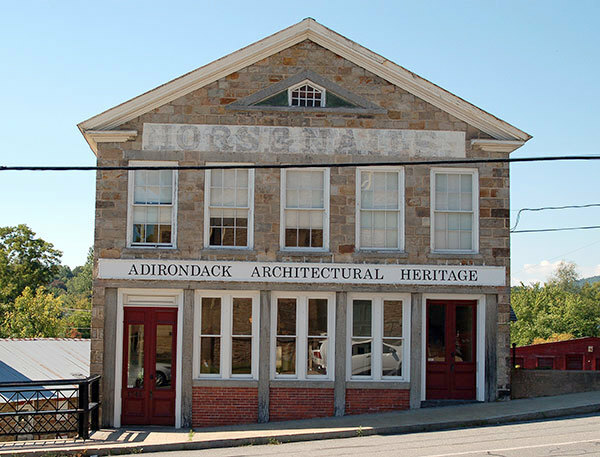 The first arriving in the late 1800’s and early 1900’s from visitors arriving by train to visit the Adirondacks and stay in the great hotels and take in the sights. The second by people who had automobiles and the leisure dollars to visit and even build second, vacation homes. In both developments, it was the establishment of the Adirondack State Park in 1892 that made it possible for the public to have access to the park and prevented the land from being in control of the wealthy few. The principal forms of making a living became new types of manufacturing, commercial dairying, recreation and tourism. AuSable Chasm is a prime example of the shift. What started as iron, lumber, paper and flour milling evolved, through economic necessity and the ingenuity of the residents, into a flourishing tourist industry, which makes use of the river power in an equally contrasting application to that of the first settlers. The AuSable Chasm Horse Nail Works was one of the last surviving secondary iron manufactories in the region. It closed its doors in 1910. But the AuSable Chasm Company had been operating the chasm as a tourist attraction since 1873. Using housing built by the nail works, the company created the AuSable Chasm Inn complex in 1922. Seven cabins and a motel were added in 1939. Today, over 200,000 people a year visit the chasm where there are over 58 tourist related buildings. The company now employs over 70 people and is considered a major employer in the town. A significant impact of loss of the mining industry was the decline in farming. During the first half of the 20th century, many farms in the Harkness-Hallock Hill area were abandoned. Those that remained specialized in single crop production and dairying. Improved farmland decreased from 501,000 acres in 1880 to 354,000 by 1910. Today, at Hallock Hill, the town’s oldest homes and farmstead are to be found on Arthur Road, Chasm Road, Hallock Hill Road, and State Route 9N. Similarly, as the manufacturing of iron products declined, the railroads left too. 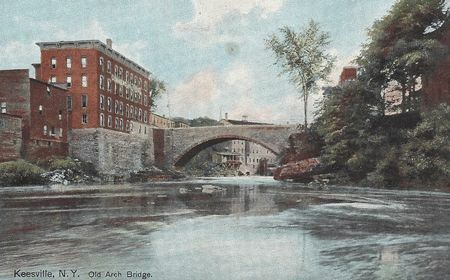 Case in point, the Keeseville, AuSable Chasm and Lake Champlain Railroad, established in 1890, had provided transportation for industrial and tourist enterprises until 1924 when it stopped operations. Today, the only active rail line is provided by the Canadian Pacific Railroad along the shores of Lake Champlain to connect New York City to Montreal, Quebec. In their wake, the rail lines left a number of striking bridges across the AuSable River, symbols of a vibrant, thriving past. 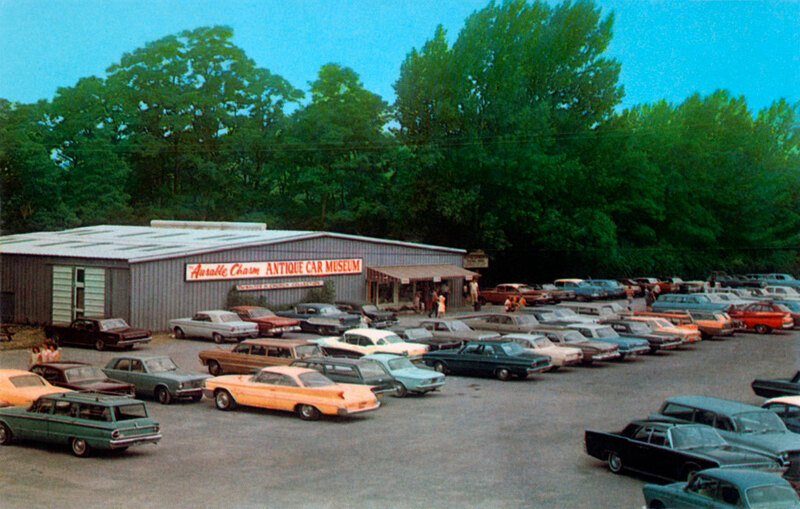 Automobiles saved tourism in the Adirondacks. Along Routes 9N and 22 in the first half of the 1900’s diners, motels, tourist attractions sprang up only to be eclipsed later when the Route 87 Adirondack Northway was constructed through Chesterfield and AuSable bypassing those earlier tourist businesses which then collapsed. On the other hand, the new highway provided the opportunity for the buildiriven by summer tourism and the demand for second homes. Automobiles saved tourism in the Adirondacks. Along Routes 9N and 22 in the first half of the 1900’s diners, motels, tourist attractions sprang up only to be eclipsed later when the Route 87 Adirondack Northway was constructed through Chesterfield and AuSable bypassing those earlier tourist businesses which then collapsed. On the other hand, the new highway provided the opportunity for the building of summer homes and camps by people who wanted to make a second home in the Park. The development of the last half of the 20th century was principally driven by summer tourism and the demand for second homes. The Adirondacks are accessible to over 55,000,000 people. According to recent studies, the entire Adirondack-Champlain region is at an important stage in its history. Heavy industry and mining in the region have been almost entirely phased out. Tourism has emerged as the most significant source of revenue in most locations. In 1995, Plattsburgh Air Force Base closed and the community, including the Town, felt its loss financially. Community leadership emerged to recreate the local economy, which had been so dependent on the air base population. Efforts to attract new businesses to the area and to the base property have been highly successful and promise to bring a level of prosperity and increase of residents not seen since the iron mine days. The Town of AuSable is gradually becoming a “bedroom community” for Plattsburgh and its new business people. The Town can expect to see increasing residential development, especially in the eastern half. Today, the Town of AuSable is a pattern of older farms and homes from the iron boom days and buildings that accommodate tourism with a mixture of small commercial enterprises developed by people determined to preserve their rural roots. The extent to which tourists and summer residents are attracted to these various communities (including the Town of AuSable) is generally the extent to which they are succeeding.